Now that your chicken coop is built and all of the necessities are installed, there are plenty of opportunities to use your creativity. After you’ve spent some time enjoying the antics and feather fluffing of your adorable flock, it’s time for more projects to tackle. There are a ton of inspiring websites that describe whimsical and unique coop additions, and many have tips for do-it-yourself decorating projects that will keep you busy. 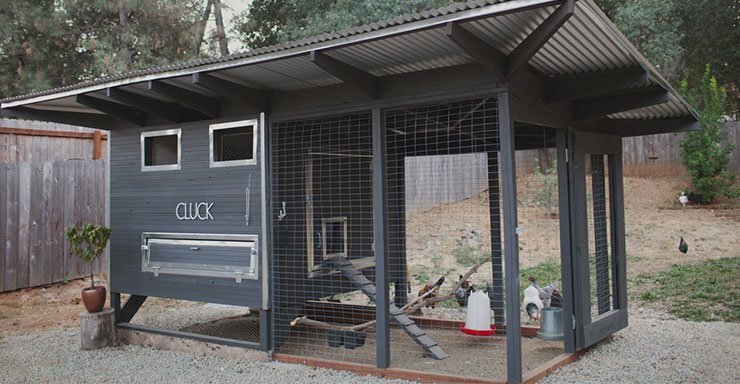 The chicken coop is part of your property, and there’s no reason it has to be a plain and dull outbuilding. You can make it look like a storybook cottage, with gingerbread on the eves and brightly painted shutters. If your coop has several windows, hang decorative window boxes and fill them with bright and cheerful flowers. Your fairytale cottage will be the talk of the neighbourhood and a fitting place for your ladies to dwell. If your tastes run more toward traditional décor, think about turning your chickens’ abode into a Spanish villa. A stucco exterior will give it a Mediterranean flair, or you can apply textured paints that resemble swirled ceramic. Chickens like to have dim light in their nesting boxes, so hanging nesting box curtains in a coordinated pattern can add flair to the design. There are plenty of options when you paint the inside of your chicken coop. A light color will brighten the small room, and the fronts of the nesting boxes can be painted a different shade for contrast. Some people even have stained glass in the accent windows to match the overall color scheme. If your décor is more rustic, you might choose muted farmhouse colors with a chalky finish. From time to time, you’ll want to sit and spend a few minutes with your chickens, so be sure and include seating in the coop. For a light and airy fairytale cottage, a white-painted wicker chair is in keeping with the whimsical fantasy theme. If your coop resembles a tiny Moorish castle, you can use an engraved vintage chest as your place to chicken-watch. For a rustic hen house, an overturned vintage washtub would be perfect. Mexican floor tiles are relatively inexpensive, and they’re perfect for giving a mini-villa an authentic look. These uneven colored terracotta tiles have been used for centuries and are still popular despite the more expensive modern tiles that are now available. Some people choose linoleum for the chicken coop floor since there are a variety of finishes and patterns available. A bonus of using linoleum flooring is that it’s inexpensive and easy to clean. Even if you decide to use concrete flooring with a drain in the middle, it doesn’t have to be plain. Concrete can be stamped with a pattern of your choosing when it’s poured, such as leaves or geometric shapes. Another style choice is to add color to the mix before pouring to create a floor that’s in harmony with the rest of the surroundings. You’ll want to make sure that natural and chicken-safe dyes are used in any kind of chicken coop floor finish in order to keep your flock safe. Of course, whatever covering you choose will end up hidden by pine shavings. Nevertheless, it can fulfill a creative impulse to see your chicken coop design coordinated down to the last perfect detail. Vintage is in as a fashion statement, and a chicken coop is a perfect place to display collections of vintage items. Look for old farm accessories when you go to garage sales or auctions, and group them together on the walls for interest. A lot of old equipment can be repurposed, making it using the second time around. For example, there are vintage egg baskets that are still perfectly good for gathering eggs. This kind of detail will add to the rustic charm of your chicken coop. A decorative wall clock is one element you can incorporate into your overall chicken coop theme. There are some beautiful ceramic and metal wall clocks that blend utility and art. A hanging thermometer is another item that incorporates both functionality and beauty. You can buy a handmade artisan wall thermometer, or perhaps find an old vintage one that advertises bygone products. A mirror with a vintage wooden frame will also go well in the chicken coop, and it’s entertaining for the chickens. Chicken coop hand-lettered signs are a charming way to decorate the space. A sign that says “Farm Fresh Eggs” or one with the name of your chicken farm is a nice touch for the coop. Many artisans create wooden signs, yard art, and wind chimes to blend with the look of various hen houses. For a vintage look, an old restored pegboard will add to the rustic theme while giving you a place to hang your gloves and feed scoop. For many generations, herbs have been used for a variety of purposes, including maintaining good health, keeping away insects and just adding a pleasant scent to the surroundings. Herbs are helpful in many ways, for both people and chickens. Oregano can help strengthen a chicken’s immunity to various diseases and sage is a chicken anti-oxidant. Lavender is an herb that smells nice to people while it also keeps insects away from the coop. Add mint to nesting boxes to promote tranquility among the hens and repel bugs and rodents. Plant your herb garden in the chicken yard and let your feathered friends roam and graze on the bounty. Thyme is good for your chickens’ respiratory systems and parsley is full of vitamins they need. An herb garden with a variety of plants will make an attractive focal point for your yard, and there will be plenty to share between the kitchen and the coop. It’s good to have a utilitarian overhead light for when you need to get a close look at things or clean the chicken coop. But chickens prefer soft lighting, and it can give the inside of the coop a lovely ambiance. One way to achieve this effect is to use strings of tiny LED bulbs inside the coop. Hang rope lights along the rafters and outline the door with them. They can also be used to outline the exterior of the hen house to provide gentle lighting in the yard at night. Chickens do best when they stay on a regular lighting cycle, so it’s better to use red bulbs when you need to see inside the coop at night. Any type of lighting fixture is fine for daytime light, just as long as it’s on a timer that shuts off at night. The length of the day should stay consistent for your hens. LED bulbs are a good choice because they’re not only decorative but cool burning, which makes them less of a fire hazard. If you have a fenced yard in addition to your chicken run, you can supplement your chickens’ diets by planting decorative plants, vegetables, and fruits that are also beneficial to your fowl. Every day when they roam, they can get extra exercise and eat some vegetation in addition to digging for worms and catching insects. It’s easy to create a beautiful landscape out of chicken-friendly plants, and your hens will love you for it. There are lots of ways to beautify your coop. As long as you’re hanging feeders and watering tanks, why not hang a few wire baskets full of flowering plants? A pergola in the yard is another landscaping feature that benefits both chickens and their people. It provides a place for climbing plants to grow and creates shade for both you and your lovely birds. Some chicken coops have a small porch in front of the door to help keep out yard dirt. This is also a great spot to add decoration, and a lovely touch is to create a path leading up to the steps. You can make one with paving stones surrounded by mulch or keep small pebbles in place with crossties on the sides. Paint the door a vibrant color and the path will draw attention to it even more. Wouldn’t it be nice to have several lovely bouquets decorating the inside of your chicken coop? Of course, you won’t want to take the time and trouble to put fresh flowers everywhere, and there’s no need. It’s fun to dry flowers in pretty arrangements, and just about any flower will dry nicely if you follow the right steps. There are a few steps to drying flowers just right. Choose flowers that are full-size but with petals that are not completely open. The flowers will continue to open even after stems have been cut. Cut flowers right after the dew dry in your garden in the morning, and use sharp scissors. Trim extra leaves and take the flowers inside to create your arrangement. You can make bouquets of cut flowers for drying, but be sure that they aren’t packed too tightly together so they’ll dry completely. The drying flowers need a cool, dry place with plenty of air circulation to dry – like a chicken coop! Hang them upside down until completely dry. They’ll be decorative and colorful in both directions. You can also preserve flowers by drying them in the microwave. To end up with flowers that look much as they did in the garden, silica gel will work wonders. This is an especially good method for hardy flowers like roses or zinnias. One of the best ways to dress up your wooden chicken coop is to add colorful shutters. You don’t have to stick to just one color, either, and vintage designs such as diamonds and silhouettes are a cute touch. The window trim will draw attention to the windows and liven up the coop. Old plantation shutters are great for painting any way you want and, since they’re for a chicken coop, they don’t have to be perfect. Adding decorative wooden pieces to the top and bottom of each window is another strategy for catching the eye. Or you can simply stencil a matching design on the top and bottom of the window. A beautiful flourish in a contrasting color would be a classic way to highlight the coop windows. Flowers, leaves, and vines would also add a quaint touch to the décor. Sliding hurricane shutters are a rustic touch for your chicken coop. The shutters hang from a sturdy metal bar atop the window and they can be positioned on each side of the window or slide in front of it. Old barn wood can be repurposed to create these primitive-looking accents as part of a country chic style for your chicken coop. One of the most beautiful accents on some chicken coops is artistic painting on the window panes. You can paint them using stencils or do it freehand, and there are so many intriguing themes to explore. Flowers are always lovely, but you can use your imagination and create illusion paintings that look like a hanging birdcage or stained glass. Giving new life to old containers is a whimsical way to decorate your chicken coop. Use an old china teapot to store your small hardware on a shelf in the coop. Make an antique wooden toolbox into a planter and put it next to the teapot. Plenty of plants thrive in the kind of low light that’s found inside your hen house. Paint tin cans and glass mason jars with coordinating colors and place them between the larger items. Label everything with crafty signs – and we mean everything! Etsy is a treasure trove when it comes to a handmade chicken coop and yard signs for your setup. You can sink a post in the ground and cover it with signs that have the names of all your hens. Match the color scheme of the chicken coop or make it a rainbow of different colors. Name your hen house and proudly display it on a sign over the door. There are lots of other ideas for cute and colorful signage in your chicken yard. You can put up a ‘chicken crossing’ sign, a painted map of the coop and surrounding yard, and small handmade signs identifying your plants. Funny signs add humor, and a ‘welcome’ sign is a friendly addition to any yard. One adorable yard art trend is attaching large, oversized wooden flowers to the side of a chicken coop or shed. It adds a crafty and homey touch to your small buildings. You can also paint or stencil the flowers if you would rather be more involved in creating the art. Whimsical little touches like adding bugs to the flowers ramp up the cuteness factor. A clever idea for expanding the chicken coop décor to the rest of the yard is to add a birdhouse that’s a miniaturized version of the coop. This can be mounted on the top of a post or hung from a tree branch in the yard. It will draw the eye and add interest to the overall design of your coop and yard. Use decorative white picket fencing along a bottom couple of feet of the chicken coop run to give it a homey atmosphere. You can outline planted areas in your yard with the same fencing in a shorter height, and this will add continuity to the yard design. The fencing along the run also gives your chickens added protection against predators. A beautiful and comfortable wooden bench is a lovely addition to your chicken yard. You’ll especially want one near the coop where you can watch the antics of your flock. Place it under a shady tree for hours of relaxation and enjoyment. There are endless decorating ideas for your bench, such as heart cut-outs on the back of the bench and stencil painting on the arms. This idea will add charm to the chicken coop or yard, and your hens will love you for it. Place a sturdy wooden ladder in a shady spot for your ladies, and they’ll make use of it to perch and survey their yard. This will fit in well with the chickens’ pecking order, as the dominant hens will claim the higher rungs. You can paint it whatever color you like, or a variety of colors to match the surroundings. Whether your coop resembles an adorable cottage, a lovely villa or a rustic barn, it’s an expression of your own taste and decorating talent. A hen house can add to the style of your property, and fixing it up can be a fun and engaging way to spend your free time. It’s especially rewarding to come up with ways to create lovely surroundings that are also beneficial to your flock. We hope some of these ideas will spark your imagination and creativity when it comes to decorating your own chicken coop!